Blue Midnight MS Custom “Chicago style” tuning. 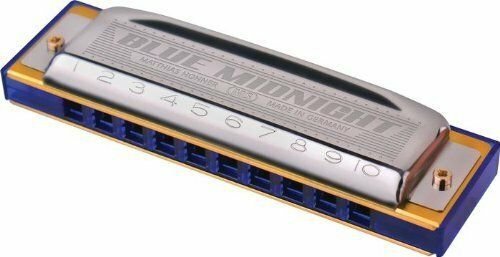 The latest addition to Hohner’s hand tuned diatonic harmonicas manufactured in Trossingen, Germany, the Blue Midnight offers a unique combination of features and construction that lets you master a wide range of tonal possibilities, puts you in control of powerful dynamics, and makes evocative note bending easy - all at a value price. Features Custom “Chicago style” tuning from Hohner’s vaults Trademark blue plastic comb offers a comfortable mouthpiece for ease of playing that will never swell Stainless steel cover plates with wide open back ends for maximum volume and tone Assembled with two single screws for easy customization of reed gapping and set up.